Hello everyone! Today I'm using a gorgeous stamp set that is just newly released, which was illustrated by Melanie Muenchinger. It's called Wild Flowers, and is available at Gina K. Designs. I just had to Rock N Roll those beautiful flowers, and I've also glitzed them up a bit with my Smooch Glitz. I'm using lots of Spellbinders Dies again, and the embossing is done with my Square Lattice embossing folder (SU). Thanks for visiting, and happy weekend!! Oh I love the rock and roll technique on those flowers!!! Beautiful! Beautiful colors and I love the flower! I always love your use of nesties! Don't you love that glitz? Beautiful flower and card. Hi Rose Ann I love your PRETTY card. Love how those flowers look in the rock and roll technique, especially in those colors! Pretty! WOW! This is gorgeous! Love the Rock n Roll technique for this image. This is a gorgeous color combo, Rose Ann!!! The rock & roll is perfect, I agree. So pretty! 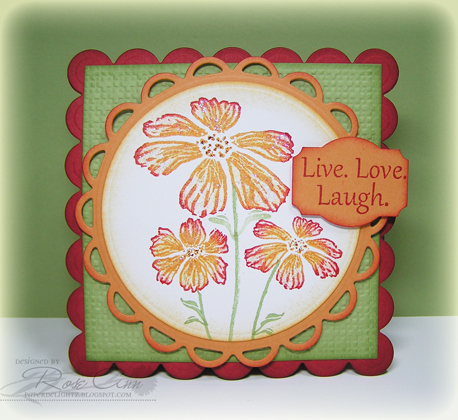 I love the mix of inks on your stamped image! love the gorgeous colors you used too. Great card Rose Ann! This technique is perfect for this image! Great layout - great card! I could never get my rock 'n rolling to come out this good. Love your color choices and those beautiful flowers! You really "rocked" this card, Rose Ann! Love the technique, love the glitz!